I hate this time of year. It’s just so busy, and I can never find the time to get anything done. For those of you who stop by regularly, you’ve already noticed my absence. I apologize, but I don’t see it getting better for a few more months. I promise I’m going to make an effort to pop in more often, but please don’t hold me to that. While I’ve been a ghost on the blog front, I have been busy professionally. I’m finally submitting a manuscript to some publishers and a few agents. I can’t tell you how terrifying this time is for me. Hopefully, if I find the time, I’ll write a post on the horrors of writing a query letter. I may even show you my 15,000 drafts. I swear, freelancer query writing is the business to be in my friends. Anyways, this post wasn’t meant to be a rant, so let’s get on with it. Most of you know I’ve been fiddling around with Photoshop lately and I’ve fallen in love with making covers, so I’ve been considering offering my services. I’m torn because for starters, I’ve haven’t received any form of formal training. Secondly, I’m a little uncertain on the legalities of the process. I’ve decided to give it a try anyway. So, for anyone who is interested, contact me. Pricing will depend on the fonts, brushes and stock photos that you choose ($70 and up). For those of you who want to create you’re own covers, I’ll still provide tutorials when I get the chance because I don’t believe you have to hire someone to create an amazing cover. It just take patience. I’ve decided to start with the Demon tutorial for two reasons: it’s one of the easier covers I’ve created, and it also introduces most the important things you need to know to create a great cover. STEP ONE is finding the perfect face for your demon. 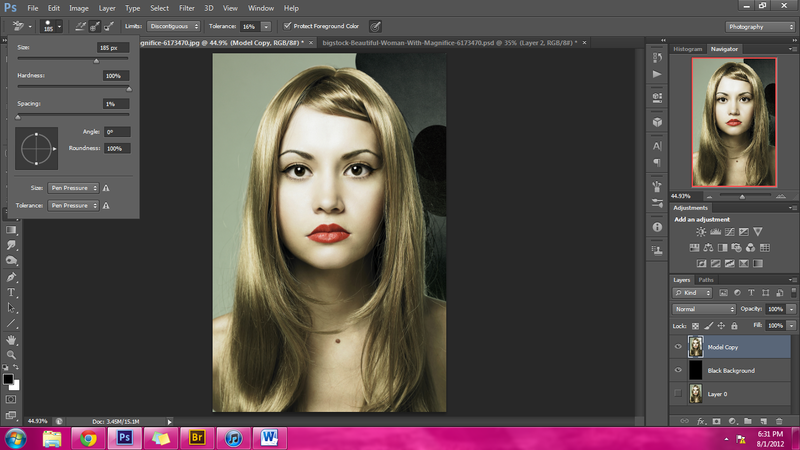 I wanted my model to look emotionless. I found her here. 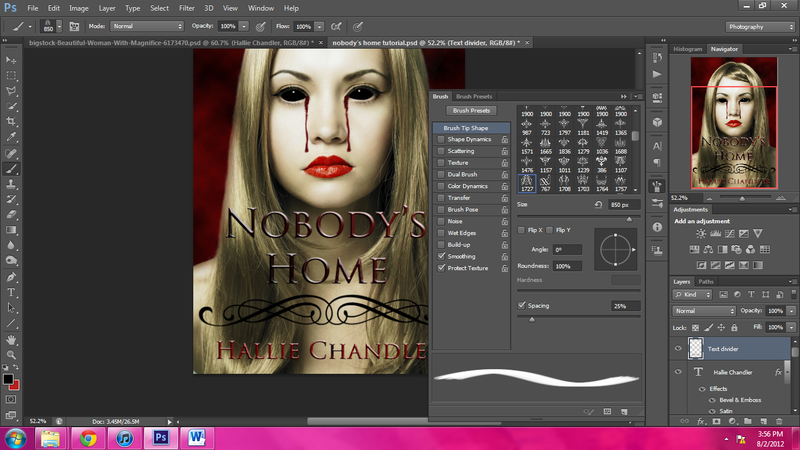 I bought the medium size because I have no real intention of actually using this cover for publication anytime soon. If you’re just using this tutorial for practice and don’t intend to share your creation publicly, you can just grab a free picture from the internet. 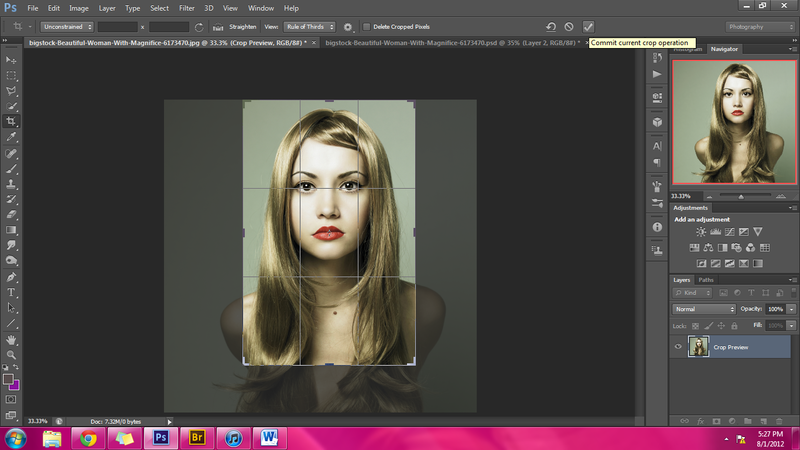 STEP TWO Once I have my picture open in Photoshop, I want to create a duplicate layer in case I mess up later on. 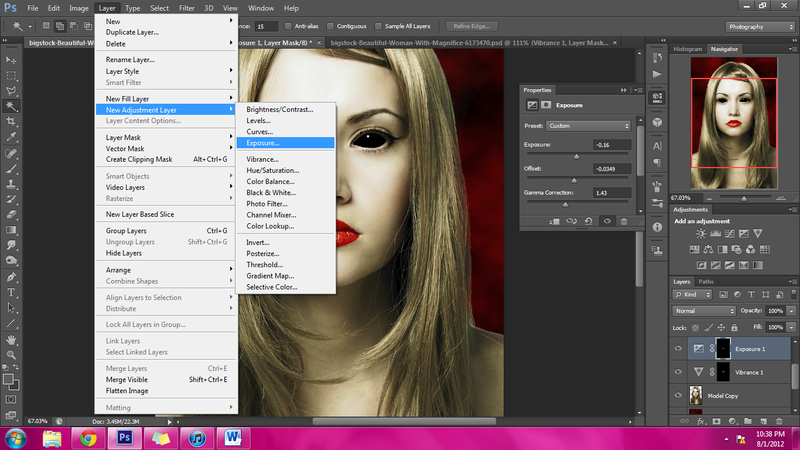 To do this I go to the LAYER tab, and click DUPLICATE LAYER. It should give you the option to title your layer, I used the title MODEL COPY but it doesn’t matter what you choose, so long as it’s something that will help you find the layer later. After doing this, you should see two little icon size copies of your picture on the RIGHT side of your screen. Now, click on the EYE beside the image that is labeled BACKGROUND. And the EYE should disappear making your backup layer invisible and impossible to screw up. STEP THREE I want to crop the picture into the shape of a book cover. The CROP TOOL is found in the LEFT TOOLBAR. 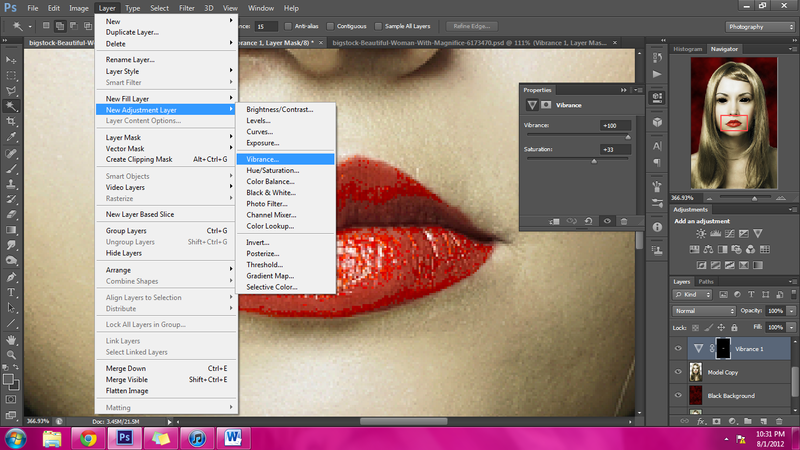 It’s the fifth icon down in CS6 (the latest edition of Photoshop). Now, just use your mouse to move the sides in until you have the desired size and area. To finish cropping your selection, go to the TOP TOOLBAR and make sure the DELETE CROPPED PIXELS is unchecked. This is a personal preference, because I don’t like to lose any pixels in case I want to come back later and make the cropped selection bigger. Once you’ve done that, click the CHECK MARK on the top toolbar. It should be located to the right of the DELETE CROPPED PIXELS option. STEP FOUR I want to create a background layer. It won’t be visible until after we cut out the background in this layer, but when you are using the background eraser tool you’ll be thankful for the black background layer. STEP FIVE Now we’re going to paint our new layer black. First, go back to the LAYER ICONS on the RIGHT SIDE of the screen and click on the EYE beside the MODEL COPY to make it invisible. 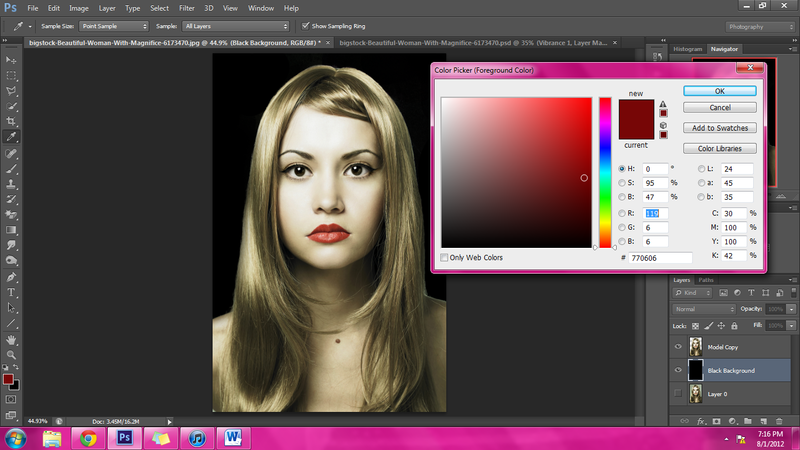 Now, go to the LEFT TOOLBAR and click the PAINTBRUSH TOOL, it’s the 8th icon in CS6. Then, RIGHT CLICK on the icon and make sure the BRUSH TOOL is chosen. Now, we have to choose our colors. Again, look to your LEFT TOOLBAR and go the BOTTOM where there should be two different colored squares (COLOR SWATCHES) overlapping each other. If the square on top isn’t black, hit D on your keyboard and that should reset the default colors. Now, you’re going up to the TOP TOOLBAR and your going to click on the box shown in the picture below. This is the place you want to go anytime you want to change the shape or size of ANY tool you’re using. I call it the BRUSH SETTINGS BOX. 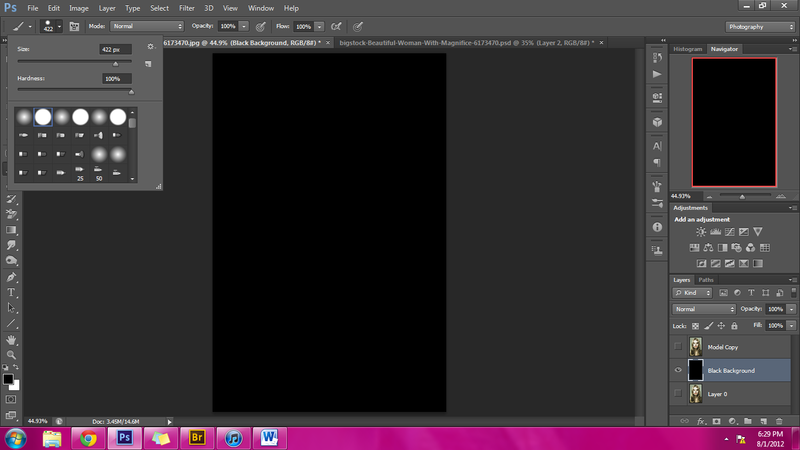 You want your brush to be fairly large so it won’t take too long to color the background black. Once the layer is completely black go back to the LAYER ICONS on the RIGHT SIDE of the screen and click on the box beside the MODEL COPY to make it visible again. Your black layer will disappear. STEP SIX This is probably the most useful thing I’ll teach you in this tutorial, background removal. You want to select the ERASER TOOL found on the LEFT SIDEBAR. In CS6, the eraser tool is the 11th icon. Now, look closely at the eraser and make sure that it has a pair of scissors on it. This the BACKGROUND ERASER TOOL, which is what you’re looking for. If the scissors are not there, RIGHT CLICK on the icon and you should get a drop screen with three options (eraser tool, background eraser tool, and magic eraser). Click on BACKGROUND ERASER TOOL. STEP SEVEN Now, we’re going to create a cloudy background. Start out by going to the LEFT TOOLBAR so that we can choose our colors. Since our top color is already black and we want to keep that color, we just need to change the white to red. First, click the COLOR SWAP button that sits right above the COLOR SWATCHES, it’s a double-sided arrow. Once you’ve done this, click on the white box. A box should pop up. Now, you want to click on the reds and choose the one that will go well with your model, for me that was (# 770606). Now, to create the clouds we first want to choose the layer that we want to work with, the BLACK BACKGROUND layer. To choose it, just go to your RIGHT TOOLBAR and click on the layer. It should become highlighted. Next, go to your TOP TOOLBAR and click on the FILTER tab, go down to RENDER, and the click DIFFERENT CLOUDS. STEP EIGHT I want to do a quick touch up of my models skin. Normally, I use the Smart blur to give my models a flawless touch, but my current model has pretty perfect skin so I’m just going to remove her mole.Very easy to do. 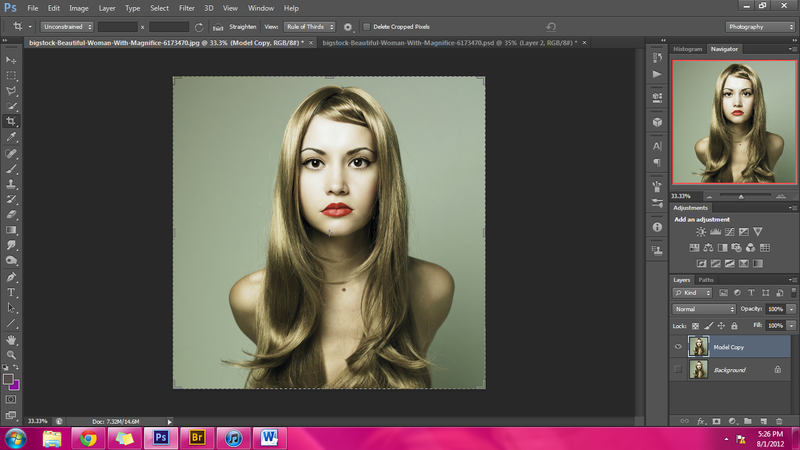 First, I’m going to select her layer by going back the RIGHT TOOLBAR and clicking on the MODEL COPY. 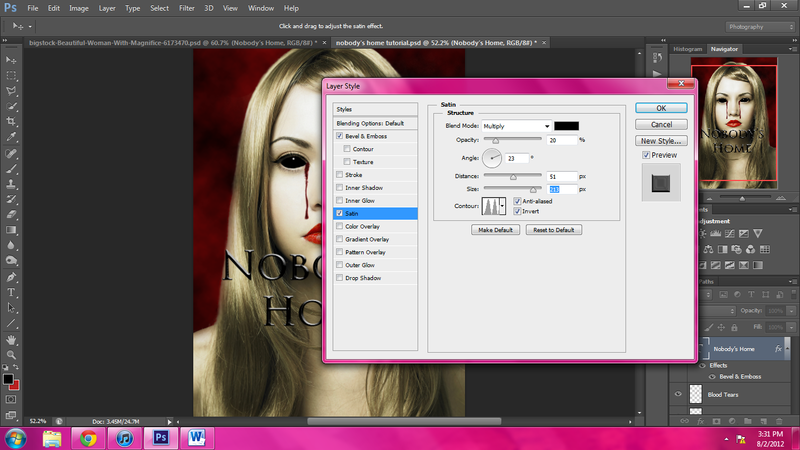 Now that I have the right layer selected, I go to my LEFT TOOLBAR and click on the SPOT HEALING BRUSH TOOL. It’s the 7th icon down in CS6, it’s a band-aid icon. Again, RIGHT CLICK on the icon to make sure the correct brush is chosen. 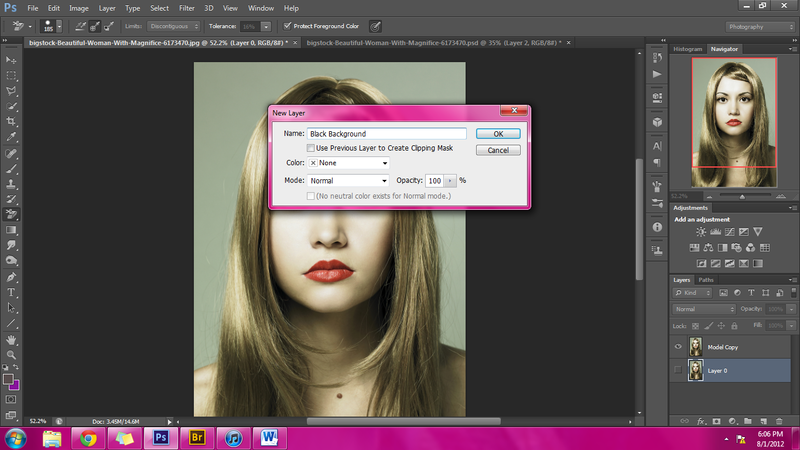 If the brush is either too small or large, go back to the BRUSH SETTING TOOL on the TOP TOOLBAR and adjust the size. Once the setting are right, just place the brush over the mole/imperfection and make sure that all of it is covered. Then click your mouse once and the mole should disappear. 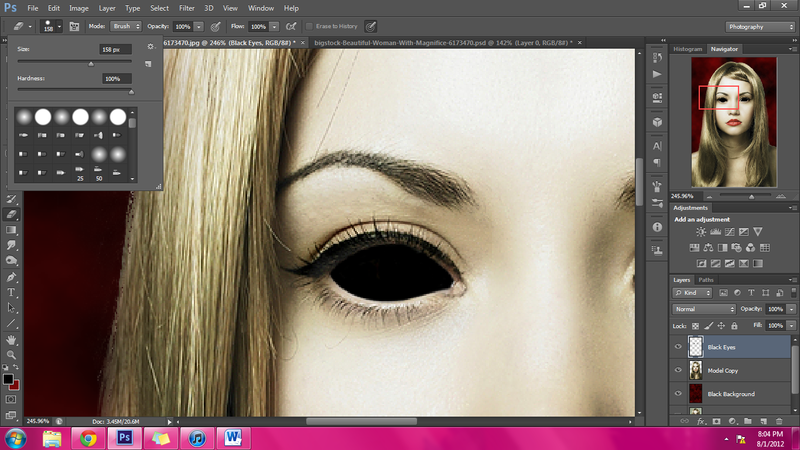 STEP NINE Now we’re going to create the demon eyes. It’s not as hard and you’d think. Start out by creating a new layer like we did in STEP FOUR. Select the MODEL COPY, then go up to the LAYER tab, select NEW, and then LAYER. Use the same settings as last time. I titled mine BLACK EYES. Now, I want to change my color back to black so I’m going to go back to my COLOR SWATCHES and hit COLOR SWAP (the double-sided arrow). Next, go up and choose the BRUSH TOOL. Once you have your brush tool selected go up to the BRUSH SETTING BOX and make your brush size really small. Once you’ve got your brush small enough, start outlining the inside of the eyeball. You want to cover all the white areas, the iris, and the pupil, but none of the skin. 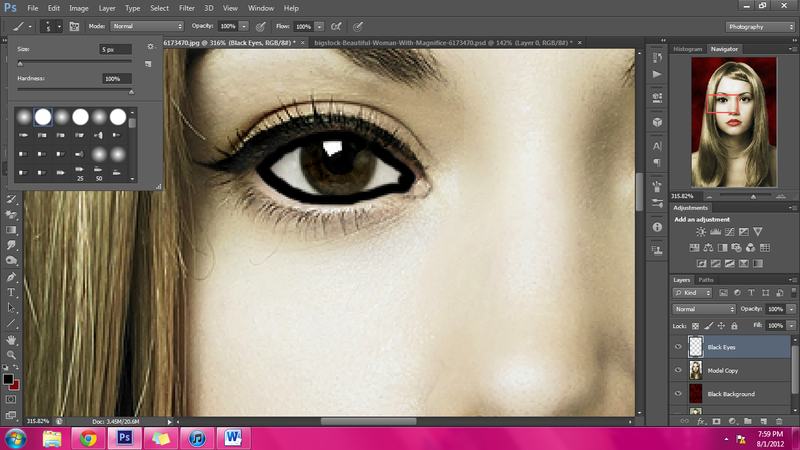 Once you have the eyes filled in, you’ll want to smooth the edges with the eraser tool. So choose the ERASER TOOL and then RIGHT CLICK on the icon to make sure you have the right setting. Once you’ve selected that, go up to the BRUSH SETTINGS BOX and increase the size of the eraser until it’s very large. Once you’ve chosen a large enough brush, go around the rough edges of the black and barely brush up against the edge. Again, this is a technique that will take a little practice on your part. In the event that you screw it up, and trust me you probably will, go to the EDIT tab and click STEP BACKWARD. STEP TEN The next thing we want to do is to make the eyes look glassy by adding white spots to the eyes. To get started, create a NEW LAYER like we did in step nine (I titled this one WHITE SPOTS). Click the EYE next to the BLACK EYES layer and make it invisible. Select the WHITE SPOTS layer again, and then hit D to reset the default colors and click on the COLOR SWAP button (double-sided arrow) to make white your primary color. Next, choose the paint brush again and go back to your BRUSH SETTINGS BOX and choose a very small brush. I choose a 6 pt. Now that you have the correct brush, click once over each of the natural highlights in the eye. Make the BLACK EYES layer visible again and you now have your demon eyes. 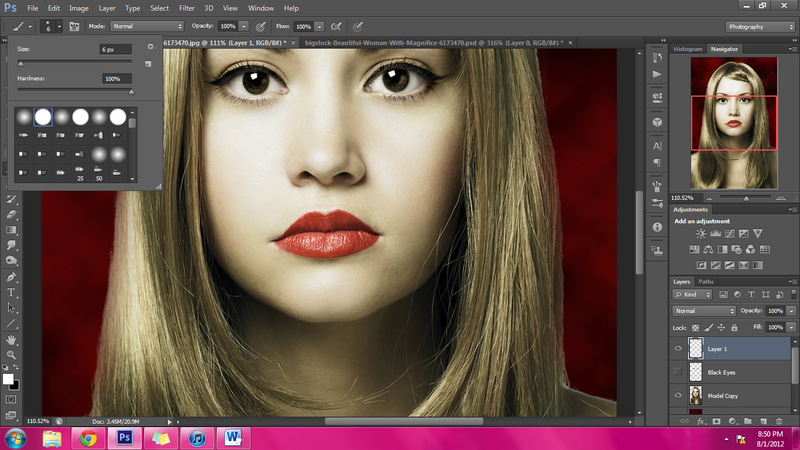 STEP ELEVEN Now that the eyes are done, the lips look a little too bland so I’m going to try and enhance the color. There are many ways that I do this, but the approach i took with this image was two different adjustment layers. 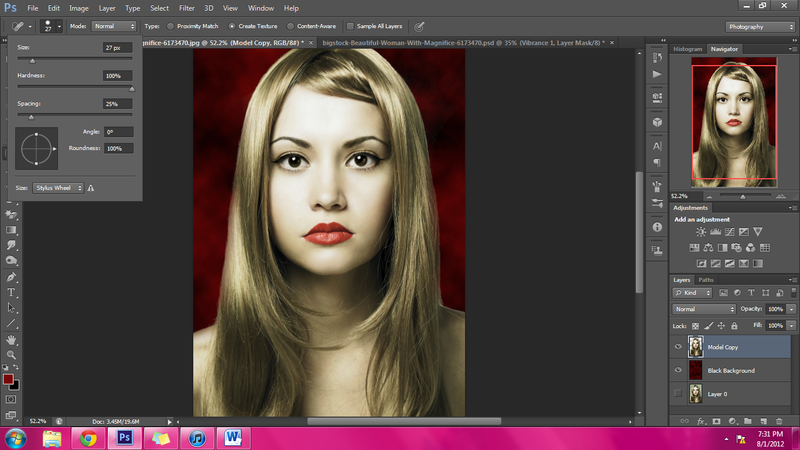 First, we’ll start by adding a vibrance adjustment layer to the paler areas of the lips. To do this we need to use the QUICK SELECTION TOOL.The SELECTION TOOL is found in the LEFT TOOLBAR. It is the 4th icon in CS6, and it looks like the paintbrush icon only the SELECTION TOOL has a circle of dashes around the head. RIGHT CLICK on the icon and choose the QUICK SELECTION TOOL, it’s the one that looks like a magic wand. Once you’ve selected it, zoom in on the lips and then click on a light-colored area. Keep clicking on unselected light areas until you think you have a wide enough selection. Next, go the top TOOLBAR and click on the LAYER tab. 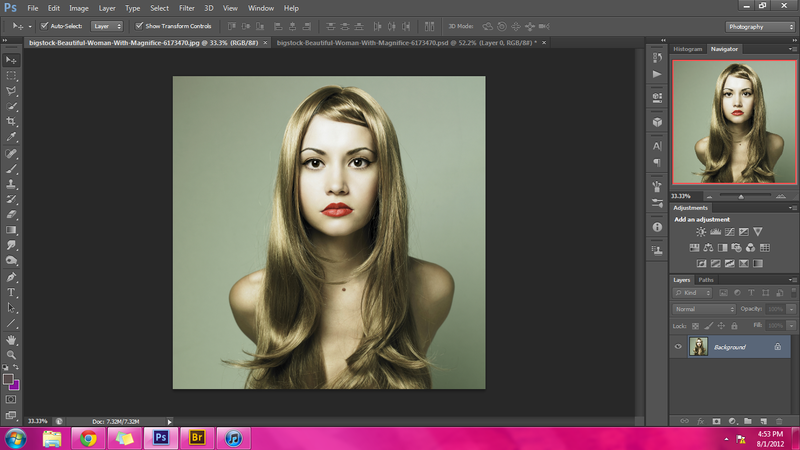 Go down to NEW ADJUSTMENT LAYER, and then go down to VIBRANCE. Slide the arrows until you find a setting that you think will work. Below are the settings that I think work best for this photo. 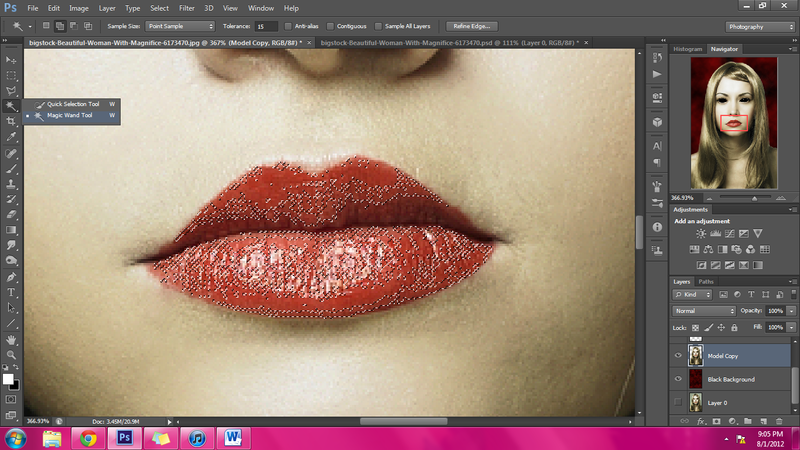 STEP TWELVE Now, we’re going to enhance the darker areas of the lips. Use the same selection technique as step eleven but this time choose the darker areas. Also, choose a larger area. Once you have your area selected, go to the LAYER tab. Go down to NEW ADJUSTMENT LAYER, and click on EXPOSURE. Again, just keep sliding the triangles until you find the setting that works best for your image. Below are the settings I think work best for this picture. 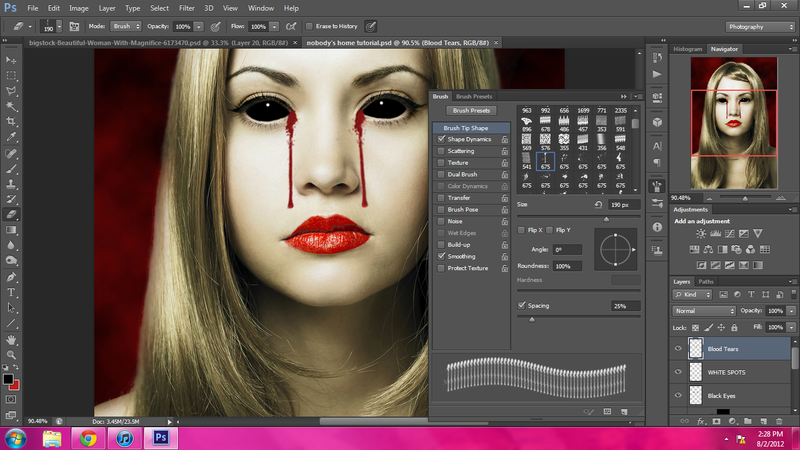 STEP THIRTEEN Now, it’s time to add the blood tears. 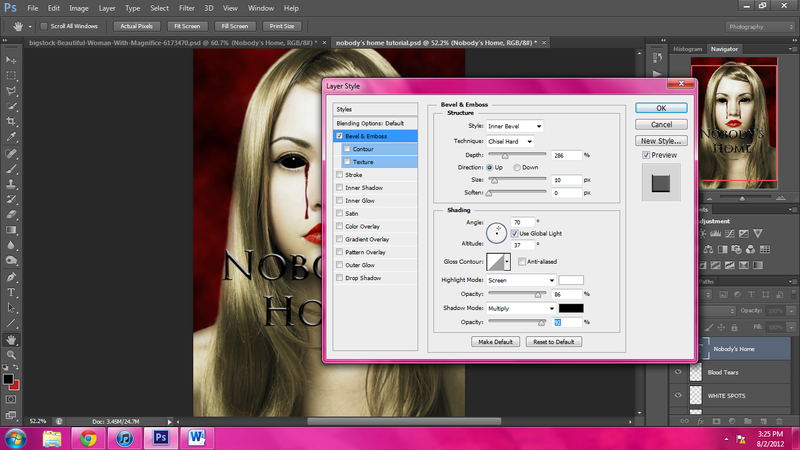 First, you add a NEW LAYER, I named mine BLOOD TEARS. Then choose the BRUSH TOOL. Once the you’ve selected it, go to the RIGHT TOOLBAR and click on an icon that looks like a pouch with three brushes sticking out of it. Once you click on it you should see a bunch of different shape brushes. 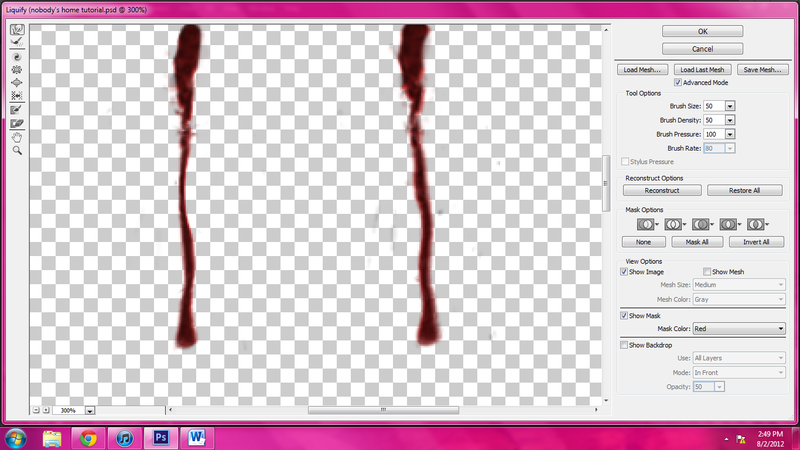 The blood spatter I chose came in the Dried Blood Splatters Pack. Once you’ve picked out the BLOOD BRUSH you want to use, you should adjust the size and possibly the angle of the brush to get the best results. Next, CHANGE YOUR COLORS to red and black. Once you have all your settings in order, create one blood trail coming from each eye. Now, hit the COLOR SWAP button and make black your primary color.Next, go to the TOP TOOLBAR and look for OPACITY, and take it down to about 60%. Now, place the brush directly over your last blood trail and apply the black layer. Once you’ve done this to both trails, use the ERASER TOOL to erase the splatters that look out of place, and also you can use it around the tear duct to make it look more like she’s crying blood. Once you’re done erasing everything that shouldn’t be there, there’s just one thing left to do to really make the tear drops as real as possible (at my skill level). Go up to the FILTER tab and click on LIQUIFY. A new screen should pop up. Go to the BOTTOM TOOLBAR and zoom in until you can see your tears clearly. Now, on the LEFT TOOLBAR choose the icon that looks like a finger pushing a line. Once you have it chosen, start using it to change the shape of your tears so that they don’t go straight down. You’ll probably mess up a few times and that’s okay, if you do just go the RIGHT SIDE of your screen and click RESTORE ALL and you can start over. Once you’re done just click OK and it should take you back to the main screen. STEP FOURTEEN It’s time to create our text layers. 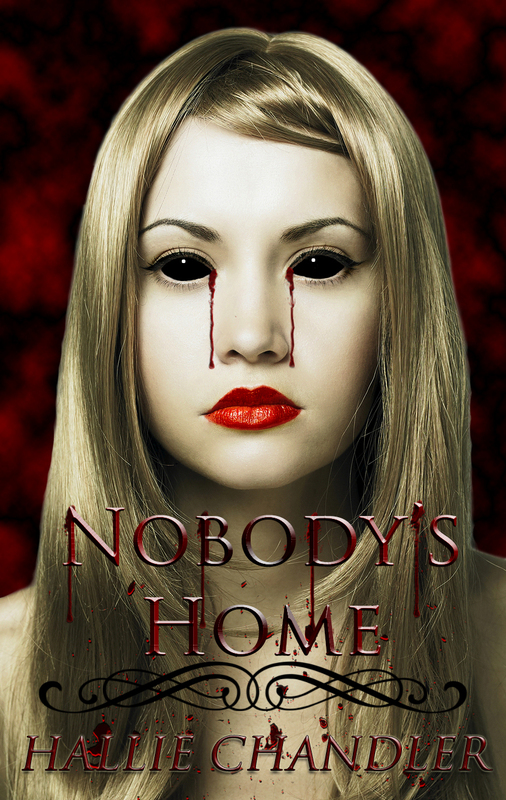 I’m going to start with the title, NOBODY”S HOME. So, start out by going to the LEFT TOOLBAR and clicking on the FONT TOOL, the icon is a T. Now, just draw a TEXT BOX out like you would in any other program. Once you’ve done this, go over to the RIGHT TOOLBAR and look for an icon with an A and click on it. This is your FONT SETTINGS BOX. From there you can choose font type, size, spacing, etc. Below are the settings I used. Now, its time to add all the special effects to your font. 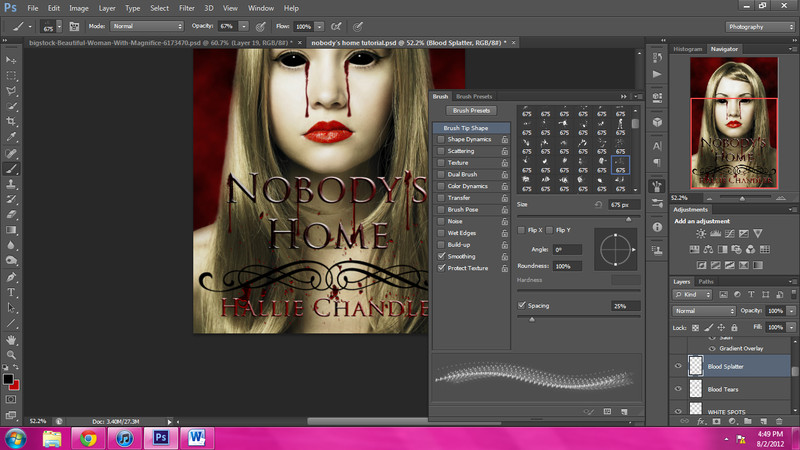 I’m going to be using three different tools for this: Bevel & Emboss, Satin, and Gradient Overlay. To do this go up to the LAYER tab, and go down to LAYER STYLE and then click on BEVEL & EMBOSS. A screen will pop up and this is the box we will be working in to do all our text effects. All of these settings can be adjusted manually to get the desired effect. Below are the setting I chose for my BEVEL & EMBOSS. Once that’s complete, go the list of effects on the left of your box and DOUBLE CLICK on SATIN. Below are the settings I used. Just like before, DOUBLE CLICK on the next effect, GRADIENT OVERLAY. Below are the settings I Chose. You might notice that your text is not where you want it. To move it around you’ll use the MOVE TOOL. It’s the pointer with a plus sign beside it. It should be at the very top of the LEFT TOOLBAR. Click on the LAYER ICON in the RIGHT TOOLBAR, that you want to move and then use the MOVE TOOL to move the text where you want it. For your name repeat this step, but this time make the font smaller. I used 18 pt. font, but the rest of the settings are the same. STEP FIFTEEN Now we have to apply the TEXT DIVIDER. The divider I used in this tutorial was found in the Decorative Brushes 1 pack. First, create a NEW LAYER, I titled mine Text Divider. Next, go the BRUSH TOOL and then click on the BRUSH SETTINGS found the RIGHT TOOLBAR (the pouch with three brushes). Now just find the brush you want and make it the right size. STEP SIXTEEN We’re almost done! 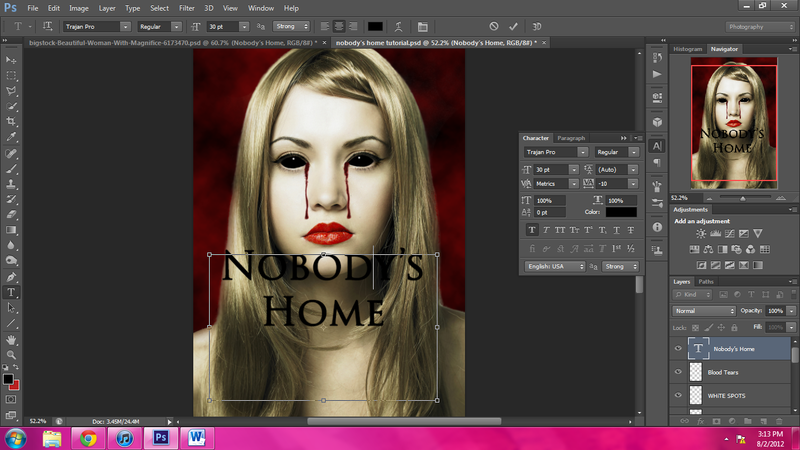 Now all we have to do is add the blood splatter layer. 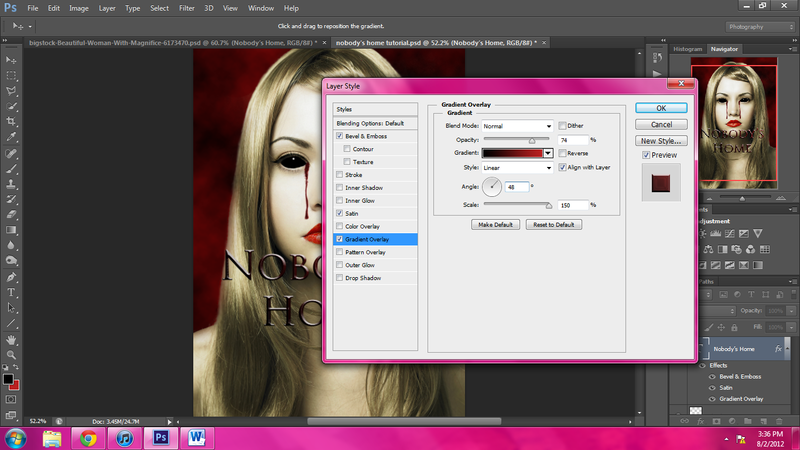 First, go to the RIGHT TOOLBAR and select the BLOOD TEARS layer and then add a NEW LAYER. 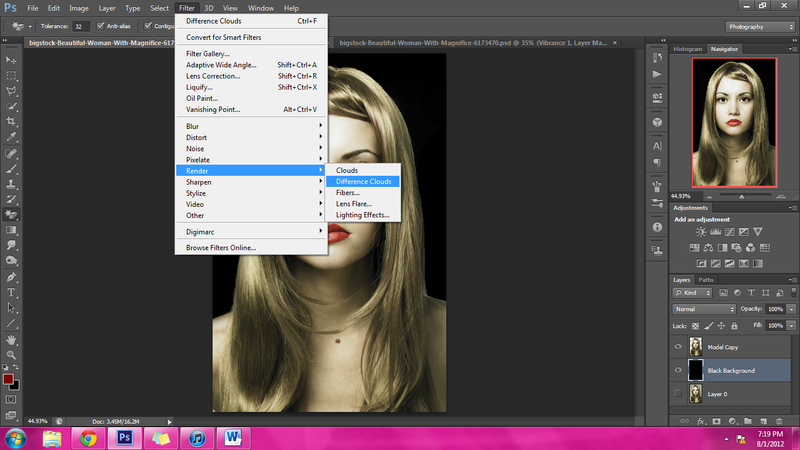 Now, select the BRUSH TOOL and go the BRUSH SETTINGS BOX on the RIGHT TOOLBAR. From there, you should choose the same BLOOD BRUSH we used for the BLOOD TEARS to make the drips on the letters. Now, do this the same way we did the tears. The first brush application should be a red the next should be a black layer that has a lower OPACITY. For the stray blood droplets I used a very busy brush that is in the picture below. Once I was done applying it, I just used the ERASER TOOL to remove and stray or distracting droplets. AND WE’RE DONE!!! I hope you all enjoyed the tutorial and learned something from it. For those of you who are familiar with Photoshop, I’m sorry about all elementary instructions but I just wanted beginners to be able to follow the tutorial without getting lost. P.S. Please forgive any typos or grammatical errors. I’m terrible with that stuff on the best of days, and right now my eyes are seeing double.